The location of this photo is Wilkinson Street and as well as two of the Bombardier built Incentro trams we can see the complex trackwork leading to and from the depot in the foreground. 211 is seen approaching the camera – and about to traverse the already mentioned trackwork – with a service which will run through to the then terminus at Station Street. 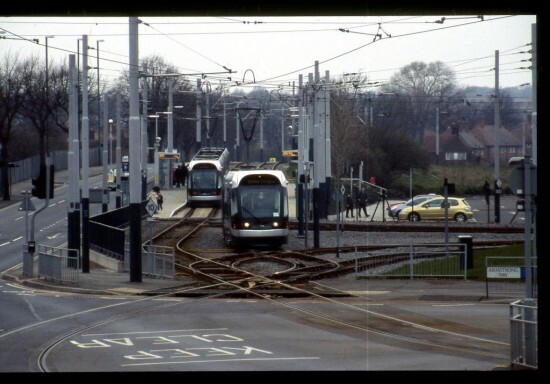 It will take the left hand track as we look at the photo with trams heading out of the city using the right hand track through the single loop going through the Hyson Green area. We can also see another tram – unidentified – at the platform. Both trams carry the original fleet livery. This scene was captured on 23rd March 2007. This entry was posted in Nottingham Express Transit, Picture in Time. Bookmark the permalink.